As I read Pseudonymous Bosch's Bad Magic, I had a bizarre feeling I was reading a junior-division version of Jeff VanderMeer's Annihilation. 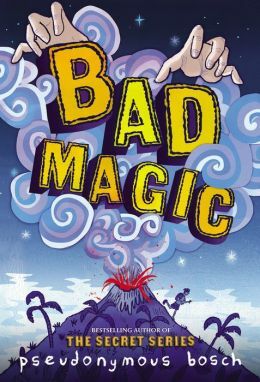 Bad Magic is a lot less creepifying (thankfully), but it covers similar ground—a mysterious, isolated place, a half-explained plot, and a weird blend of fantasy and reality. When an angry phrase from Clay's journal turns up spray-painted on a school wall, Clay's parents ship him off to the Earth Ranch, a summer camp for troubled kids located on a remote volcanic island. Nothing about Earth Ranch makes sense—Clay's guide is a Spanish-speaking llama, some of the older kids act like minor characters from Lord of the Flies, and there are rumors flying around about a ghost. Clay is determined to discover the camp's many secrets, but some things can only be explained away by magic. I enjoyed Bosch's cheerfully dorky, fourth-wall-breaking narration, the haunted island setting, and the novel's countless nods to The Tempest. (More Shakespeare!) Unfortunately, Bad Magic suffers from underdeveloped characters and a deeply irritating trick ending. I'm mildly curious to see where the series goes next, and I'd happily recommend this book to, say, an 11-year-old reluctant reader, but this simply isn't the kind of writing that holds much crossover appeal for adults.